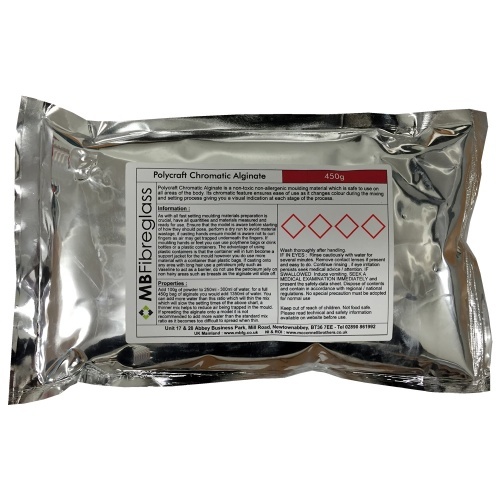 Polycraft Chromatic Alginate is a non-toxic non-allergenic moulding material which is safe to use on all areas of the body. Its chromatic feature ensures ease of use as it changes colour during the mixing and setting process giving you a visual indication at each stage of the process. As with all fast setting moulding materials preparation is crucial, have all quantities and materials measured and ready for use. Ensure that the model is aware before starting of how they should pose, perform a dry run to avoid material wastage, if casting hands ensure model is aware not to curl fingers as air may get trapped underneath the fingers. If moulding hands or feet you can use polythene bags or drink bottles or a plastic containers. The advantage of using plastic containers is that the container will in turn become a support jacket for the mould however you do use more material with a container than plastic bags. If casting onto any area with long hair use a petroleum jelly such as Vaseline to act as a barrier, do not use the petroleum jelly on non hairy areas such as breasts as the alginate will slide off. Mixing time is approximately 2 minutes from the moment you add the water, at this point the alginate will be bright pink and ready to go once you have mixed to a smooth consistency. At this point its best to place your hand / foot etc. in the alginate. During the curing stage the alginate will turn pale pink. Once the alginate goes white you can remove your hand / foot etc. For further information please refer to technical data sheet. We purchase this alginate, for we found MBFG on the internet and they are only around the corner from where we live..... turns out that they have a huge stock of products that i was able to get for my life casting hobbies, its the first i have used and will be back again for the guy was super friendly and more than helpful to us.